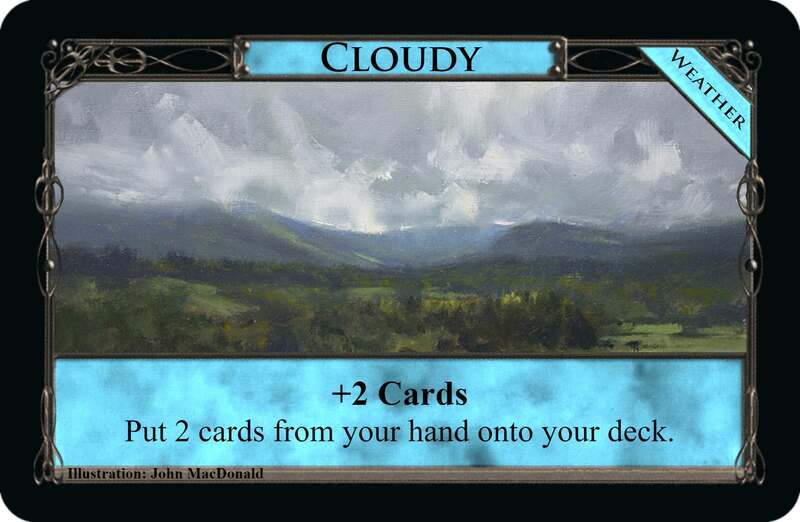 I like your take on LaLight's weather cards. What I would suggest though is having about half of them be "Clear Skies" or so that has no effect. Constant changing effects every turn will make the game far too unpredictable and probably too much to handle, whereas the occasional scattered effect would be nice. Also, maybe have it so you can see ahead so nothing comes upon you too fast. And probably try to keep the effects simple and not game-changing, like the Vanilla Boni ones could just have one bonus apiece, a free Lost City/Grand Market might be too much to give. As worded, Frost has pretty bad antisynergy with junkers, given that all cards are gained onto your deck. Well, it says "this turn," which... maybe implies it only affects you if it's your turn? I'm not sure what "this turn" means, actually, because, if I understand the rules correctly, each Weather remains in affect for n turns, where n is the number of players, right? 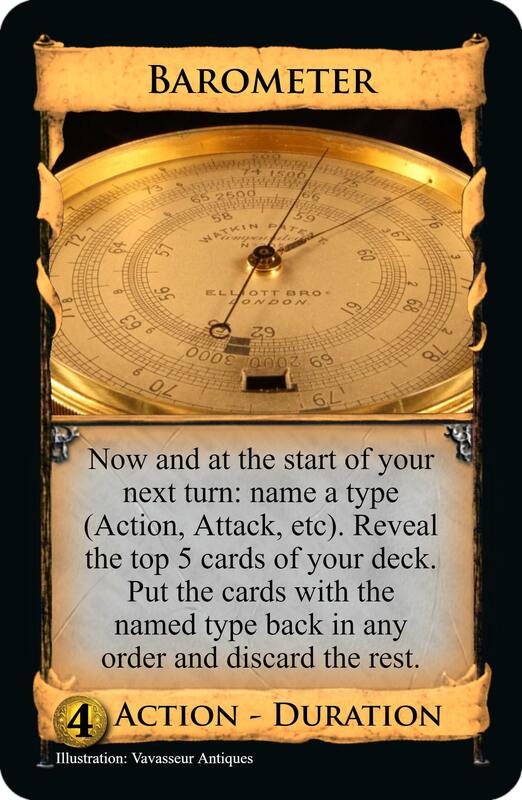 Each card is written like an Action is, directed to the individual player. Otherwise it's a case of putting 'each player gets' on each card, which is a bit clumsy looking imo. So 'this turn' here follows Bridge. You're right... That makes the distinction between Action cards and actions less clear. I'll get to changing this as I update them. Seeing this is the case, what about 'action token' Vs 'Action token'? I thought this seemed familiar as I came to it. Well, I can at least say these aren't direct rip-offs of LaLight's cards, I'd forgotten about them. Sorry nonetheless. The Clear Skies idea: this was my thinking when I did both Cloudy and Windy, to dilute the bigger changes a bit. But going with what Gazbag said earlier about both together being uninteresting, one (Windy) could leave for a blank. I could also/instead add 2 more blanks to bring them up to a 12 card pile cycling through 10 turns, for rounder numbers. You can see the Weather coming for the next turn; the top one is discarded, then it's 'active' for the round of turns, and the next one becomes visible as well. You get a turn to think about it. Current rules are the pile's face up, so that probably means players can look through the whole thing. Perhaps it should be face down and the top turned over when one is discarded. Sunny may be too much, I suppose, but Dew (Market) seems okay. It's getting the balance between effects not breaking the fun of games and their making a definite impact every time. This turn means this turn, and it doesn't imply anything. 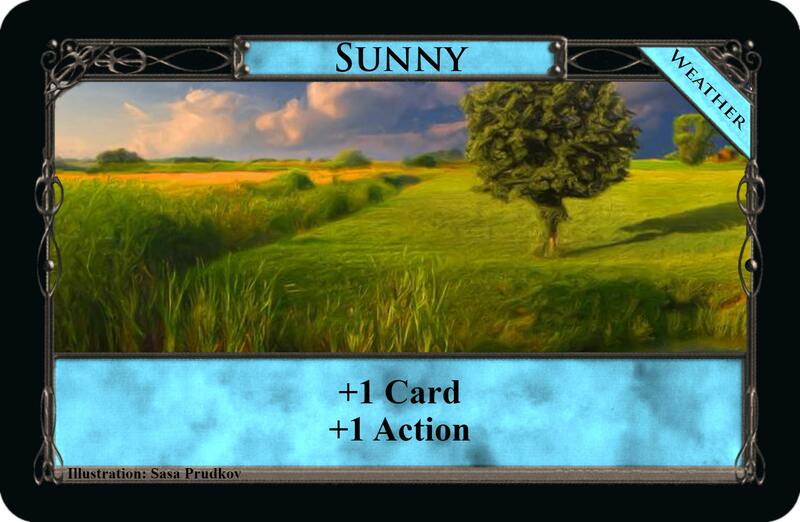 Each Weather gets "activated" again at the start of each player's turn. So here are the changed Weathers, and shortly the OP will be updated with them. 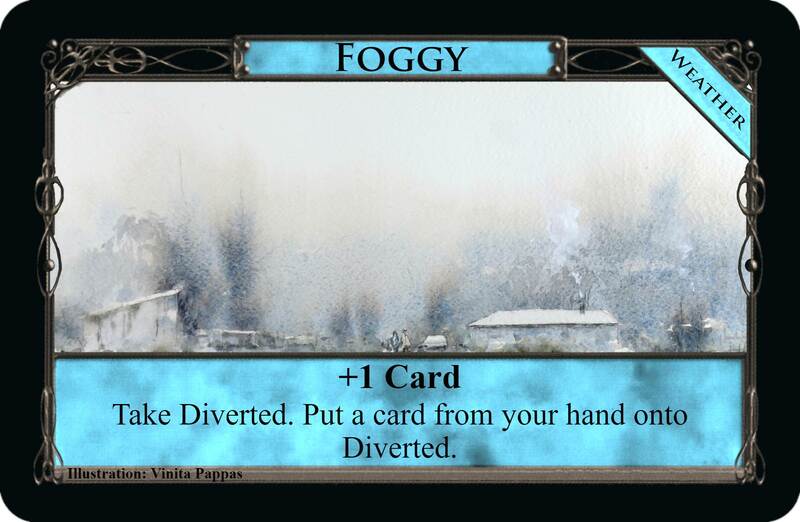 Bonuses capitalised, Frost is now Dry and wording corrected, Fog is Foggy and any card can be diverted, Dew is Showery, and there are 2 added blanks called Mild. Advancing Village - Action Reaction, $3 cost. 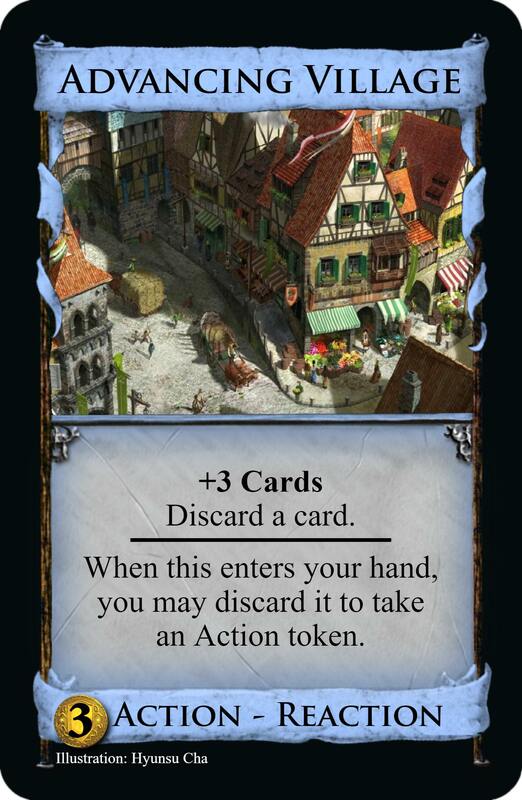 When this enters your hand, you may discard it to take an Action token. It's already been considered, but here it is again, fixed up. The new idea feels more like an Action, can react with terminal draw somewhat safely, the top and bottom combine quite nicely, and it doesn't seem imbalanced. But perhaps it's too useful too often. Barometer - Action Duration Forecast, $4 cost. Name a type. Reveal the top 5 cards of your deck. Put the cards with the named type back in any order and discard the rest. 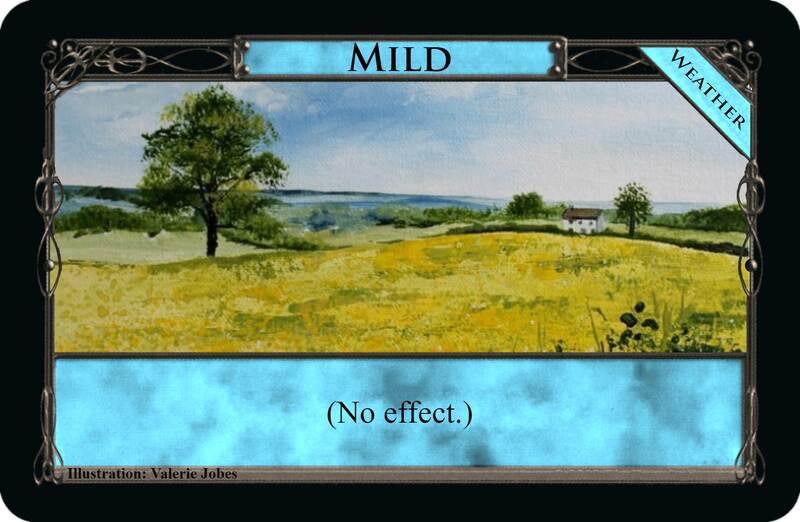 You may leave this in play and discard it at the start of your next turn, to be unaffected by Weather. I'm not exactly confident here; you'd first think a barometer would let you see the Weather in advance, but with already being able to see next turn's, will it help much to see the turn after next's? 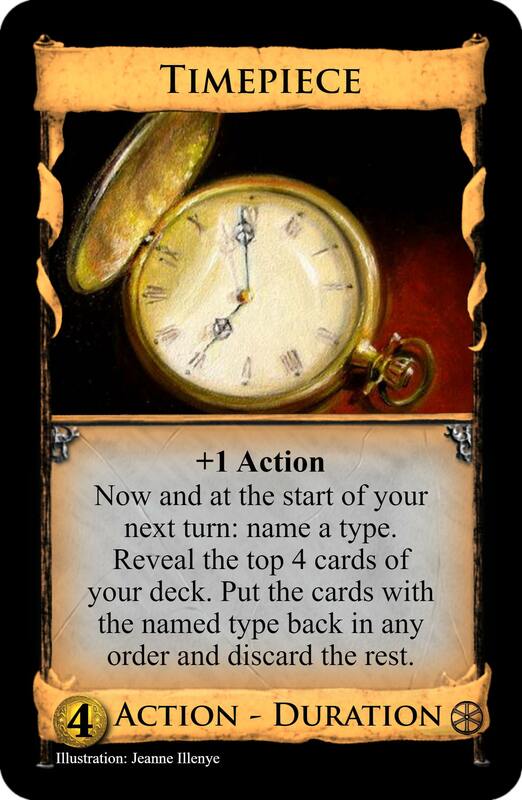 So I thought a Lighthouse might work, choose to opt out of next Weather, but you have this weird optional Duration-ish thing that finishes before your turn, really just for tracking. Sure, a start of next turn bonus would help tidy it up, but I don't want to detract from the sort effect, I think that's nice. And there's this Forecast type just to indicate that the game definitely includes the Weather. So, can this go somewhere, or should the name Barometer go? Fun fact: Weather cards that change conditions of play every turn for all players also are an expansion to my favourite non-Dominion board game, Lifeboat. I think the conditions there were Stormy, Rough Seas, Foggy, Dead Calm, Rain, Muggy, Hot, Windy and, for reasons that I'm not entirely sure of, Sunday. Clear Sky did nothing but shuffle the discards back into the pile. Also, I'm not entirely sure whether this is coincidence, but my Edicts both have a similar color scheme and look as your weather cardss, being blue sideways cards that define rule changes. Most basically do things like your weather cards, but as Edicts don't change mid-game, I also made a few of them just alter the setup. Check them out if you like. This is nice. So Clear Sky makes things a bit more random than the Weather here and sometimes there will be a weather that never shows up? I don't know the game Lifeboat, but I imagine in Dominion you'd prefer to have an idea what's coming and strategize, than have it fully random. Changing may be unpleasant for this reason. Advancing Village - that new version I thought of is broken, it can go on infinitely with draw to X. The old version stays. Blueprints - theme change to Furnace. Remodel basically is blueprints. 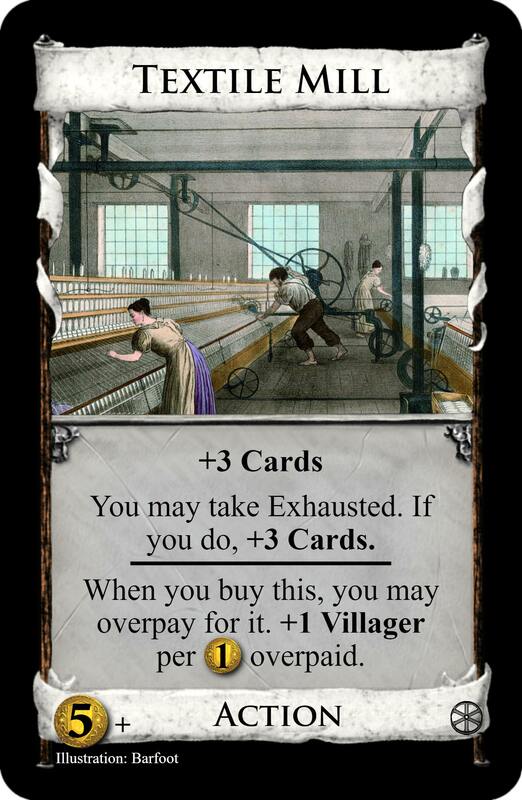 For the most part, all the Exhausted cards now involve an industrial building. Canal - it's strong enough to go to $6 cost. It's rather easy to make a Province-Duchy deck with it. Purist - down to +3 Actions, 4 was too many and now the Action and Treasure parts look more comparable. Components - a general cleanup of the group. This is no longer a Traveller and specifies gaining a Prototype from its pile. Prototype came to confusion when it was Throned before. Now it works cleanly by being a Machine itself (and not a Traveller) and saying 'exchange this for a Machine'; you can either get a final upgrade, or another Prototype to essentially make self-discard. Patent no longer has +Buy as an option, but the +Cards, +Actions and +$ are doubled to 2 each. This makes it more consistently the power card it should be. Foreign Art - Treasure, $5 cost. When you play this, take Diverted and put this on it. Local Art's out, of course, as the Wanderers are. But the name can come back if I can think of something good for it. 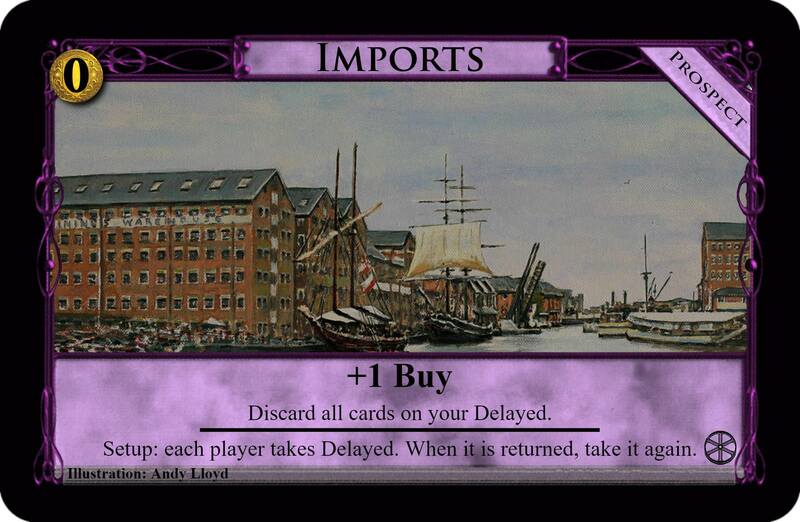 This works fine, you delay your big buys with it, or if you go for Victories it's like a Treasure Wine Merchant. Innovator - Action, $5 cost. Choose one: discard any number of cards, + $1 per card discarded; or draw up to 6 cards in hand. You may take Exhausted. If you do, get the other choice. The name's something of a placeholder, he isn't an industrial building. As yet untested, but it has that instinctive feel that it will work. Unlike the last Innovator, this one is quite easy to track. Sorry, meant to reply to this earlier. Clear Skies also has the effect that there are more rounds without weather effects, without having to print more than one blank. But yes, there absolutely can be games where one weather never comes up. 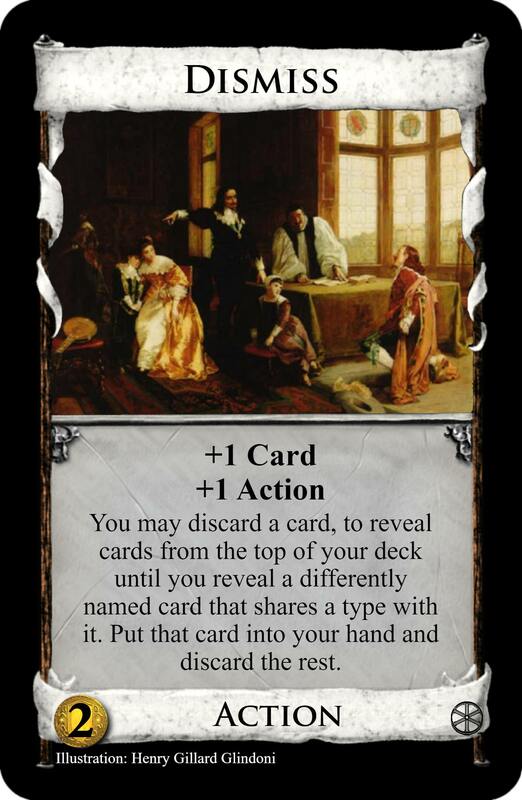 It's not as much of an issue in Lifeboat, because the game is heavily communication based and randomness can be cancelled out by convincing others to backstab somebody, but I certainly see that people might dislike the fact that a card they wait for fails to appear in Dominion (or another appears too often). It wasn't so much of a suggestion, more like an interesting anecdote, or so I thought. 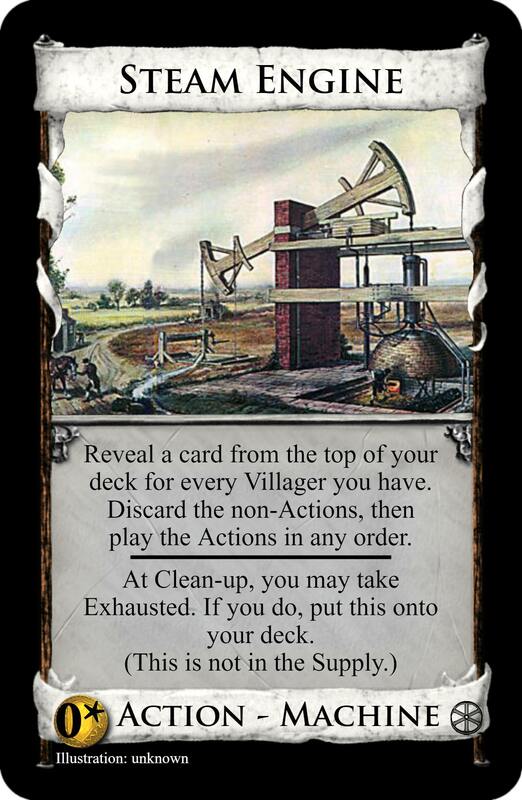 Advancing Village: That new one did look busted, I agree with going back to the other one. Furnace: This cards seems like Remake level strong to me, even ignoring the exhaust to play it immediately mechanic. Personally I don't think cards that can trash 2 or more cards at once and give economy at the same time should cost less than $5. It's not like broken trashers are particularly uncommon among the official cards though so maybe it isn't a problem. I do think that the exhaust to play immediately mechanic isn't the best fit for a $4 cards though, just because if you get it on turn 1 the exhaust doesn't do anything because you aren't playing any actions turn 2 regardless. Canal: I like this, $6 seems like a good cost for it. 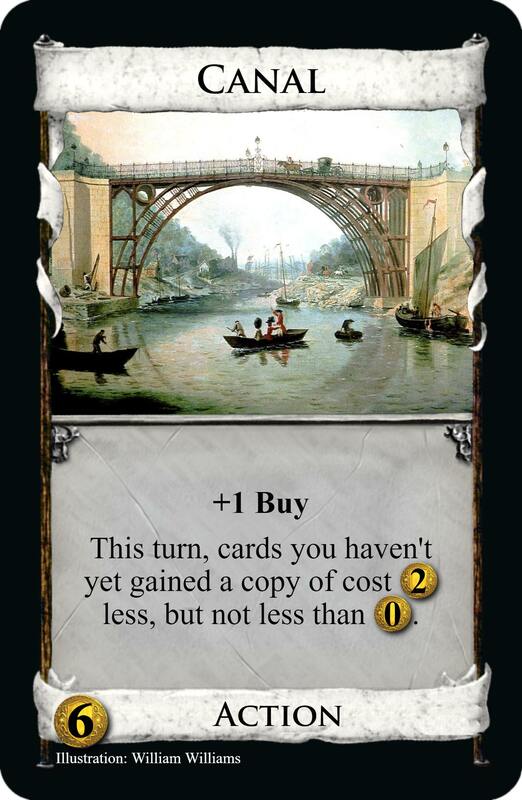 It's still probably broken half the time because cost reduction, but at least you can't accidentally buy out the Provs in one turn like with Bridge/Troll. This is thronable, I assume the wording is annoying as an in-play effect or something? Purist: Good change, 4 actions seemed bonkers on this. 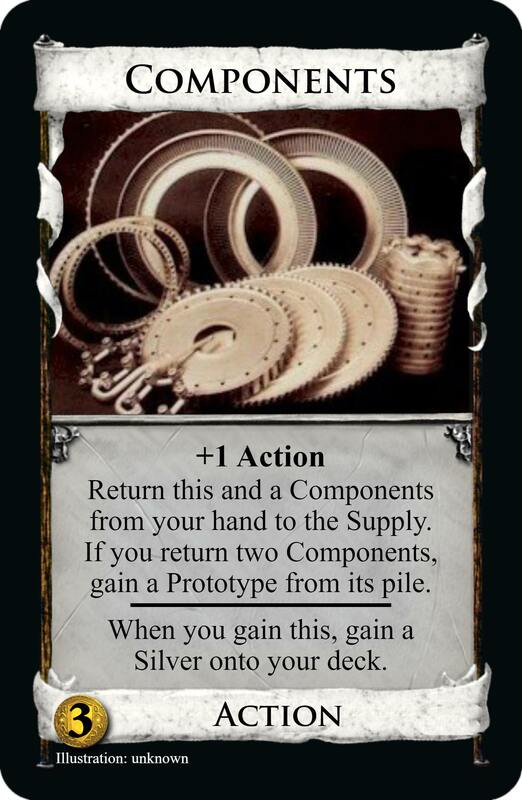 Components: Seems hard to trigger considering it adds 2 Silvers to your deck, I guess that balances being able to open with 2? Are Spinning Mule and Steam Engine in the OP the other machines? Steam Engine might have tracking problems? Maybe not? Patent and Steam Engine both seem much stronger than Spinning Mule to me, I guess that's fine. 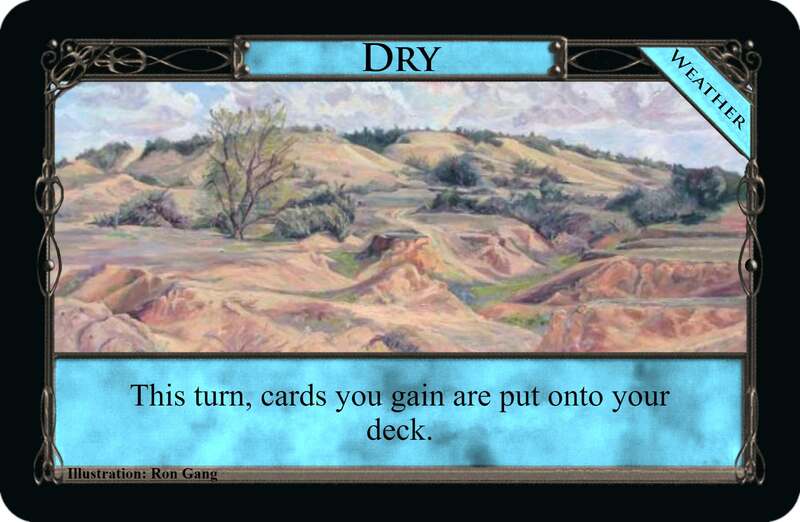 Foreign Art: Wow seems really strong, in an engine this diverting itself is basically a bonus because you want to draw it at the end of the turn. Diverting other things does make this less good in earlier parts of the game but I'm not sure it matters all that much considering how good this is as endgame payload? Less good in money, there the diverting actually matters. Insane engine payload though, should probably just be +$3 to be honest. Innovator: So individually these two effects are Watchtower and Secret Chamber. Two weak effects, is being able to exhaust for both really enough to make this worth $5? I know there's some self synergy there but I think this is really weak and could probably cost $3? I found it an interesting anecdote, though I admit that didn't come over very clearly. I thought it would be good to draw the comparisons for general game design theory, and I appreciate seeing here how the Weather affects Lifeboat, how the same idea differs to add fun to a different kind of game. I get what you say about economy. I guess the $ are there to justify the +Buy from an earlier version; for some reason a multi trasher with +Buy appeals, and that's the basis for this card. Now I've got this exhaust-to-play on it, that justifies the +Buy and the $ could go. And about turn 1, it still seems OK despite Exhausted doing nothing, as you typically only trash an Estate, and this hinders its trashing ability later. Wording should be fine as a while-in-play, I just haven't come to the conclusion of needing it yet. If it needed to go to $6, then likely it could need a further nerf and this would be it. +1 Buy + $4 is already hefty, but Throning it to 2 Buys + $12 is rather generous. All correct. From the feel as I've tested them, it wouldn't surprise me if the whole group was proven flawed because Components are too swingy and luck dependant. Or if they're only reliably enabled with sifters, or the Weather. 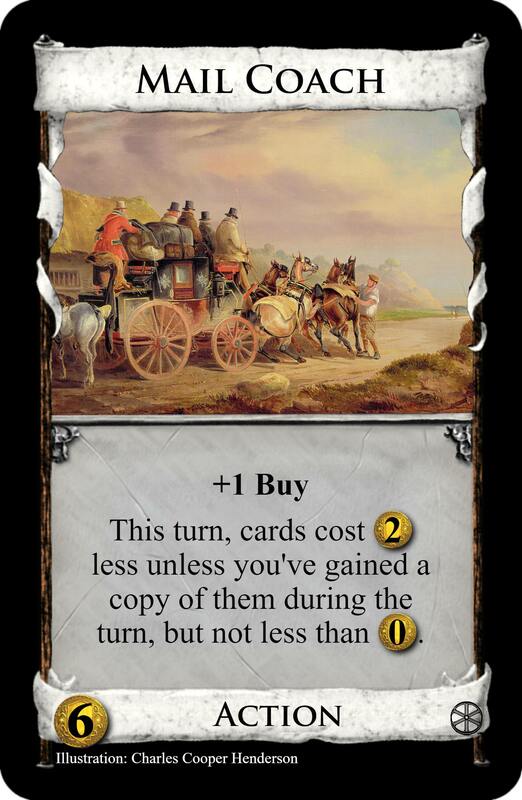 Some games have seen a Spinning Mule played on turn 7 get a runaway victory (keep the Coppers, and you can draw them, the Components Silvers, the $1 on this and whatever you do with Prototype to get at least $13), other times something like a turn 17 Prototype. Steam Engine should track OK, you can put the Action tokens on the card instead of beside them, and leave them on there for Durations. This is sensible. I twigged how the engine makes Diverted almost a non-issue, but not how diverting Treasure would actually be a benefit. My thinking with $4 over $3 is that it wouldn't really have much to set it apart from Gold except its +Buy, and it could go to $6 if it needed to, but that's not the best reasoning to go with. If this were an Action, might there be something more to it? Yeah, an untested idea, full discard then draw just seemed strong at first. Thanks for the feedback and the compliment. Components - Cool concept. On a competitive level I'm not a big fan of cards that have to line themselves up (Urchin, Treasure Map) due to how swingy they can be, but they are fun. The top decking Silver could make for some interesting openings and with calculated play you can setup your Prototype cards nicely. I just wonder if the Silver gaining could be optional. 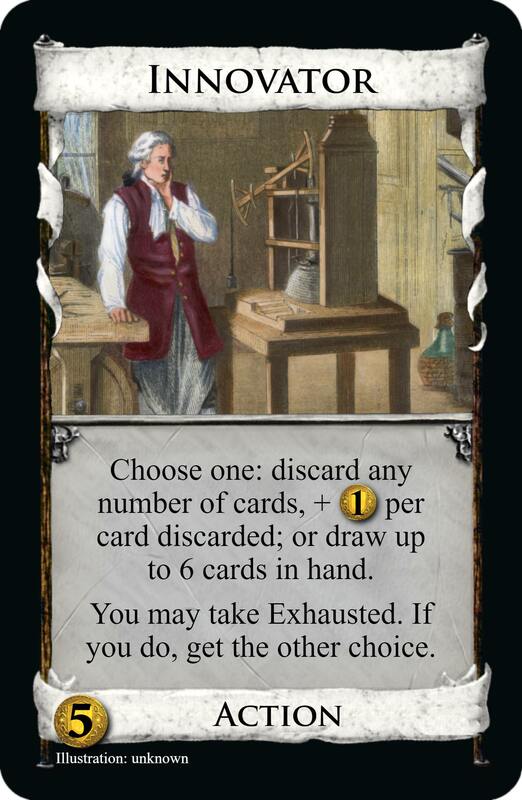 Without sifting cards, the extra Silvers just hurt your chances of your Components hitting. Prototype - This is a nice jumping off point that empowers both Action based strategies (Steam Engine/Patent) and Treasure based strategies (Spinning Mule). I like the option to keep a Prototype to get more plays out of it in order to better hone future Machine cards. Spinning Mule - Seems pretty strong, but only with pure Treasure decks. Once you have just 1 Spinning Mule you can probably draw your deck every time it's in play. So the on play is pretty one dimensional, but there is a lot of subtly in how you get to that point. 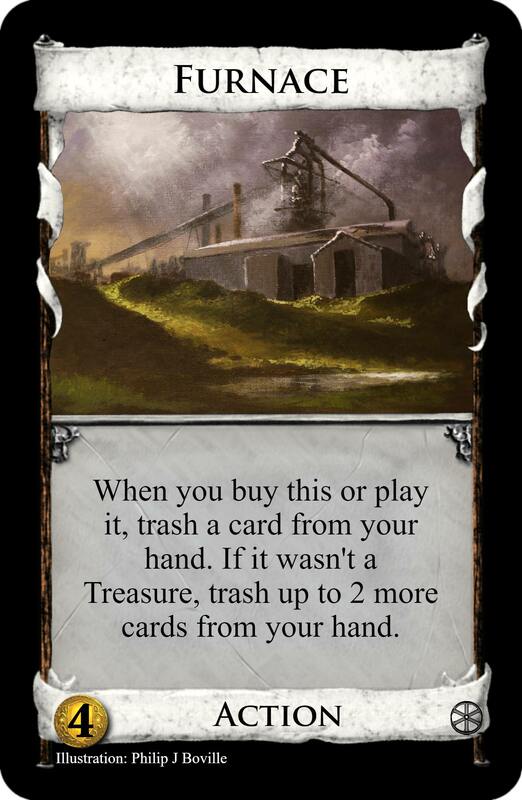 Do you trash down (if able) so your Components hit more frequently, but at the cost of Treasure drawing power later? Seems like a sound and fun decision making process. 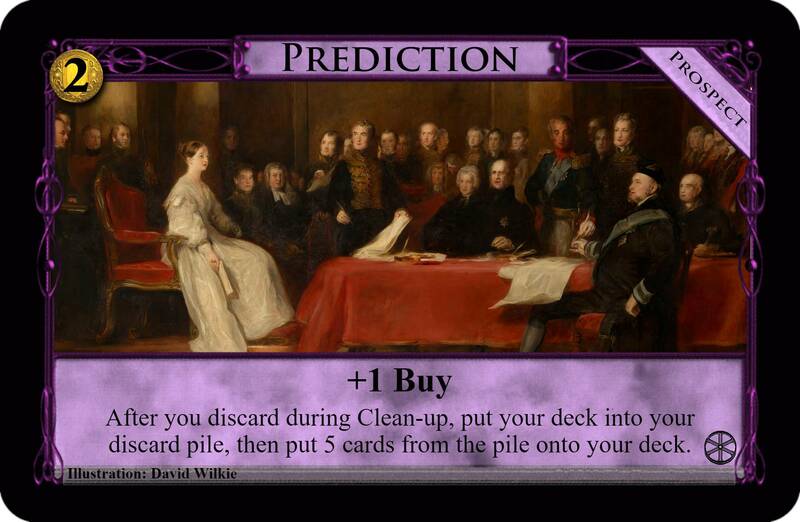 I would also add that this card is pretty worthless without a +Buys on the board, so maybe this needs a +Buy? It does after all take a while to get it and it would distinguish it even more from Patent, which is great, but also does not have a +Buy. Then again, if Spinning Mule is the only source of +Buys, it would probably be the only Machine a player would buy. Maybe both need a +Buy? In terms of formatting, there should be a line separating the above Coin and the lower text. Steam Engine - I really enjoy the other cards in this "Traveler-like" line. They seem to fit in well with when you get them and their purpose seems clear. Unfortunately I cannot say the same for Steam Engine. The wording is a bit awkward and it doesn't seem to fit in with what the other cards are and are not doing. Components is a nice little colliding game; Prototype builds up either Spinning Mule or Patent nicely (nice thematic choice by the way! ); Spinning Mule is good with Money; and Patent is good with Engines. 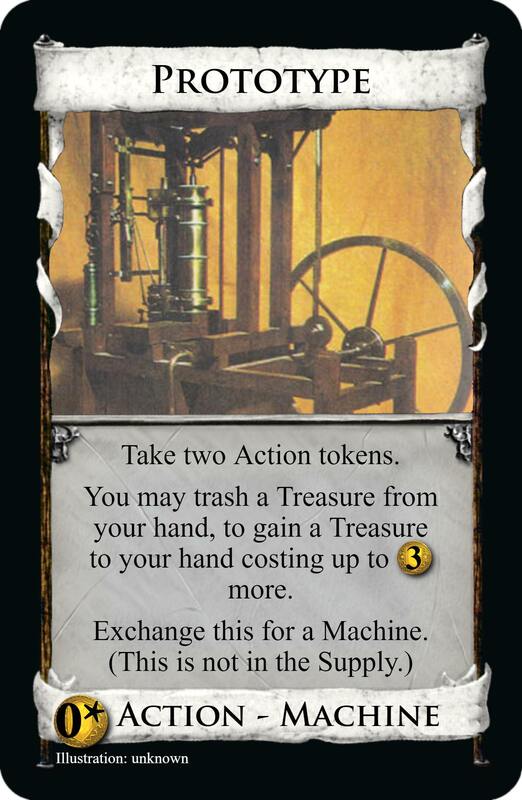 Steam Engine gives Action tokens, so the Prototype phase seems less important and it's just kind of a hard to interpret Throne Room. I think it could be good on it's own, but I just wonder if it needs to be a part of this Machine series. Patent - Really cool idea! Being the 1st player to get Patent will certainly be beneficial, but the additional choices are broad enough that even coming in 2nd or 3rd shouldn't be too much of a heart-ache. Seeing how getting this first is highly dependent on your Components colliding, I again think the Silver gaining should be optional. There are a few wording issues here though. As it's currently worded, the Patent card only becomes the card on your Patent mat in name only; it doesn't actually play it. I made a mockup of how it could be worded. 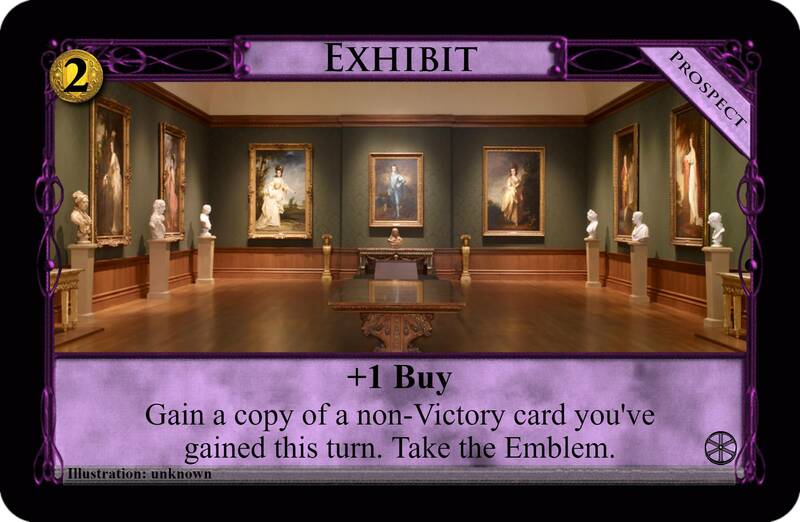 I also cleaned up the bottom portion to be more in-line with official card wording. It plays exactly the same though! 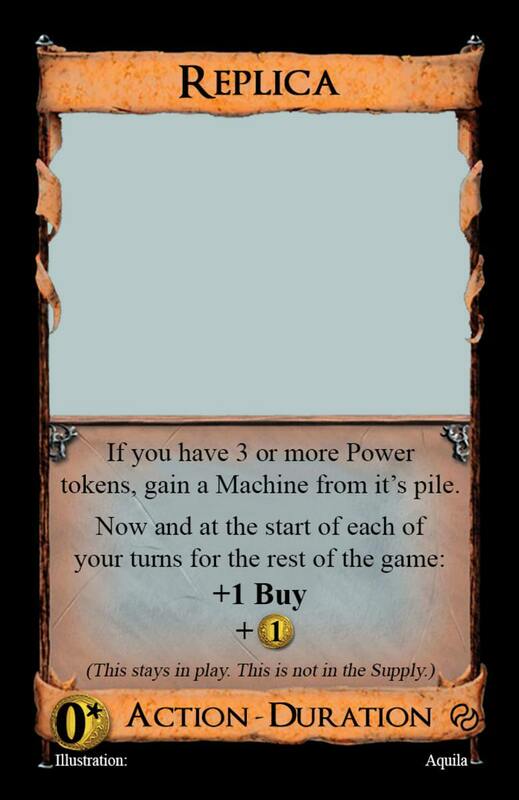 Have you considered changing "Take an Action token" to something like "+1 Power"? Kind of how "Take a Coin token" was changed to "+1 Coffers". It could go a long way in terms of clearing the wording up. 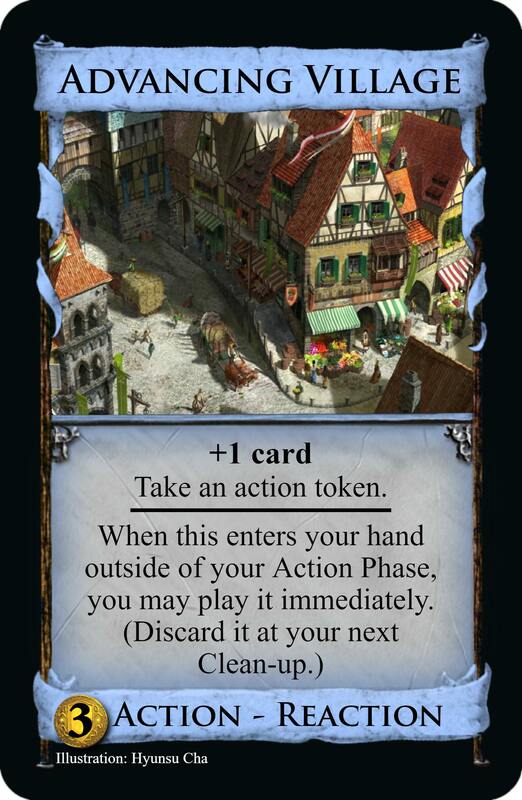 In your cards there's a lot going on with "Actions", "Action cards" and "Action Tokens". Personally my brain stops registering the difference if I see "Action" too much. 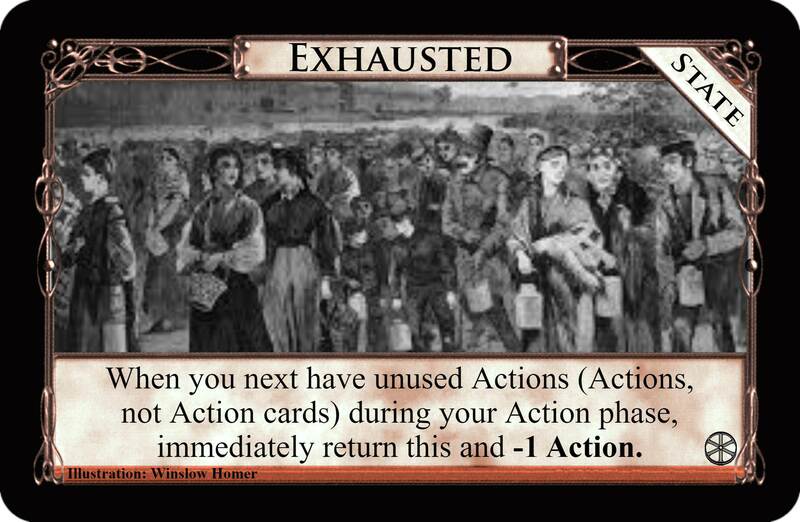 Also, has there every been a version where Action tokens could only be cashed in at the start of your Action phase? Would make for some hard, but interesting gameplay. Dairy Farm - Action, $5 cost. At Clean-up, instead of discarding this, take Diverted and put this on it. Now it draws cards and is a very strong bonus. 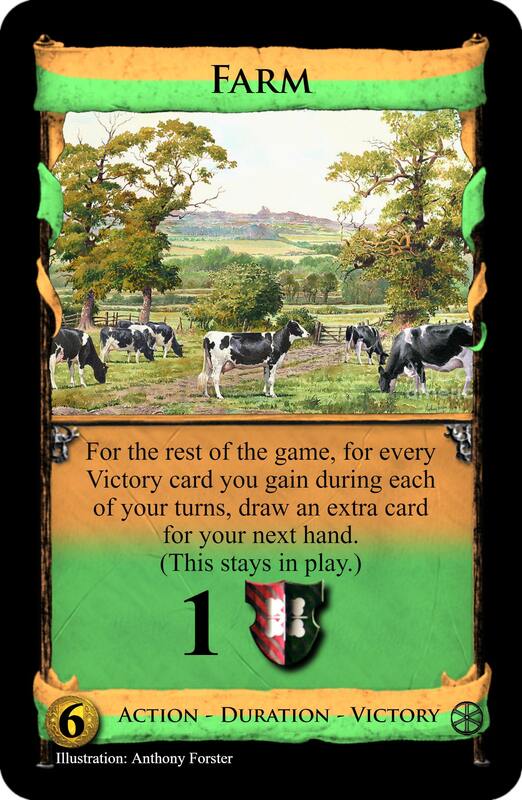 But if you do end up drawing the whole deck, getting Your Dairy Farms at the end of the draw will see some of them not much more than Woodcutters, so they play less effectively. Instant self Divert can lead to multiple plays of the same card with enough cycling, so it needs this funny wording to avoid that. Lose one Treasure, put another in. This set wants a few Treasures in it, and hopefully this one's interesting. Diverted doesn't look so good a name now so much as Delayed. Power - why not indeed? Cards would be simpler to read, and just by thinking of Power tokens on a mat, there's a feeling straight away that a card or two could care for the amount of Power you have (like Gazbag's Barbarian/Warlord in Ice Age with Coffers, but it feels more fitting to me to do it with Action tokens, you can sacrifice playing Actions now for doing bigger things later). 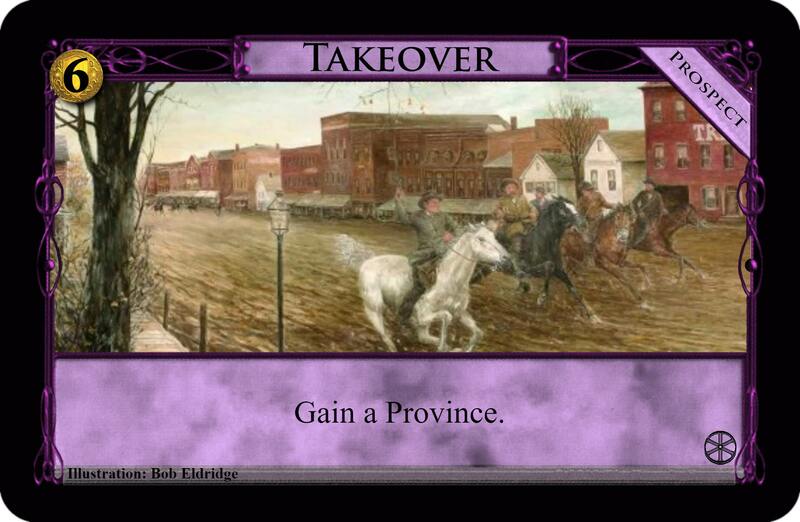 And that would give some reason for both Power and Villages in the same game. Components' Silver gain being optional makes interesting choices with Mule whilst retaining its individual function. With your other suggestions I'm seeing how opening with 2 of them won't be so broken as with 2 Treasure Maps, which was my worry. Actually using Prototype's self-discard as something you want to do rather than just because you can do self-discard safely makes so much sense. Honestly, that's all my thinking was here. Your wording for Patent is definitely better, but I think it needs to 'be the card until it leaves play' like Overlord? It's going to be wordy, and I see no way round it. Short of putting the bottom instructions on the Patent mat itself or something. You question Steam Engine's place in the series; I put it there for the contrast with Mule at first, then Patent joined in because some games would be a pretty sad race for the standout best Patent, and Steam Engine could be a fine consolation prize for the losers. Patent is a lot more flexible now than what it used to be though. 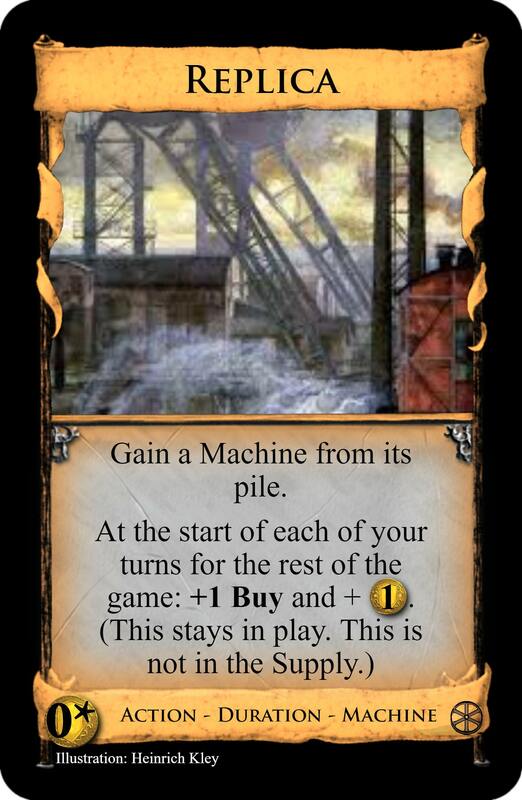 Steam Engine - Reveal a number of cards from the top of your deck equal to your Power. Discard the non-Actions, then play the Actions in any order. Prototype would give +2 Power, which could either go to playing better Patents or be stored up for this. Is this an improvement? Replica - Action Duration Machine, 0* cost. 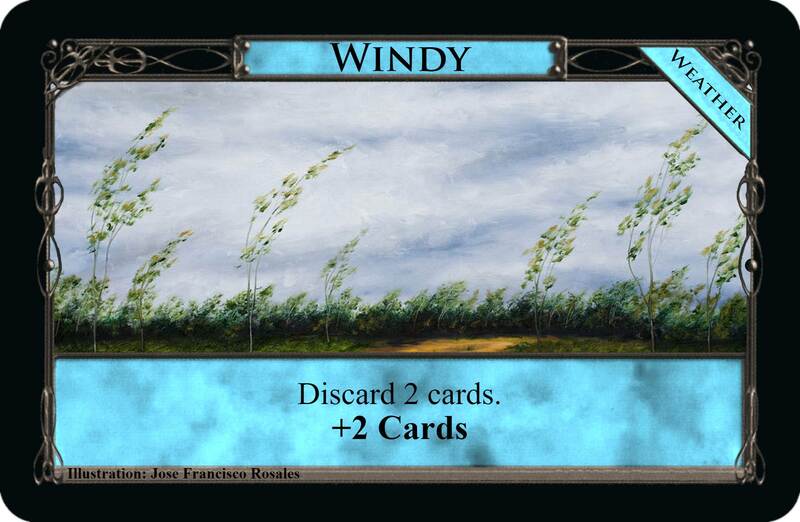 When you play your first Replica this turn, if you have 3 or more Power, gain a Machine from its pile. At the start of each of your turns for the rest of the game: +1 Buy and + $1. If you want Buys, wait a bit longer. I put the $ with it to make it feel more worthwhile, and last minute made it count Power to be a bit harder to continue. Power - Well I am certainly glad you like the idea, and boy did you take it and make it something way more exciting then a simple wording choice! I really, really like the idea of cards caring about how much Power you have. This is a complex mechanic that probably would take careful planning, but I think it can be done. I think the first big question would be if the cards that care about Power have to use the Power to get the bonus, or if it just simply checks for it. 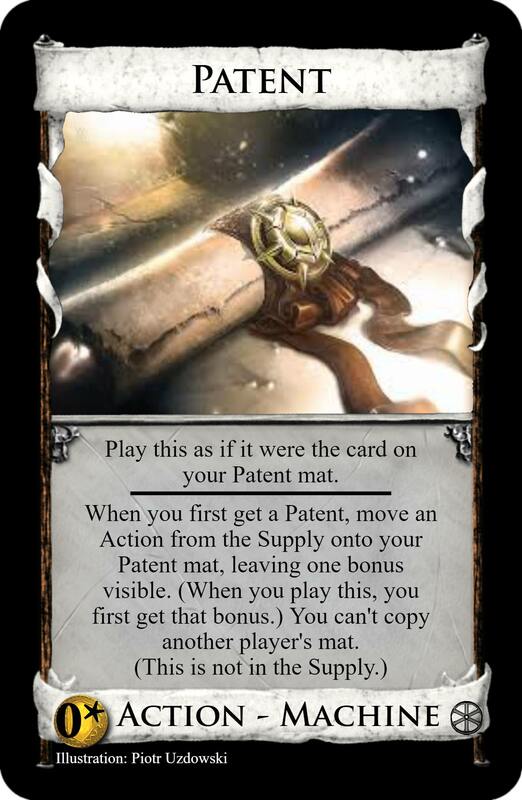 Patent - I don't actually think this needs "This is that card until it leaves play." In my opinion (and it is often wrong) all this does is rename the Patent when it's in play to whatever is on your patent mat. It does nothing to execute the patent mat card's instructions. Overlord renaming itself only matters for gainer cards like Disciple and Changeling, which care about name. Gaining a bunch of Overlords this way would be quite powerful, but with Patent it is a non-issue because it is not in the Supply and cannot be gained. 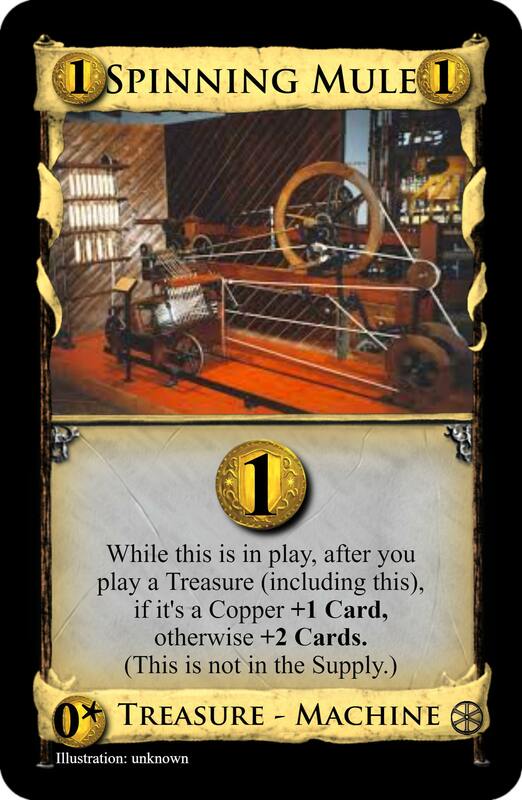 Steam Engine - Now this is an exciting card! I read it once and immediately had a good sense of what to do with it. Works a lot better with Prototype now as well. To me this now has a clear place in the Machine series. Spinning Mule is great Treasure draw, Patent makes one card very powerful, and now Steam Engine is great Action draw. Again, using Power to do cool stuff will likely need a lot of balancing, but it's such a cool idea. 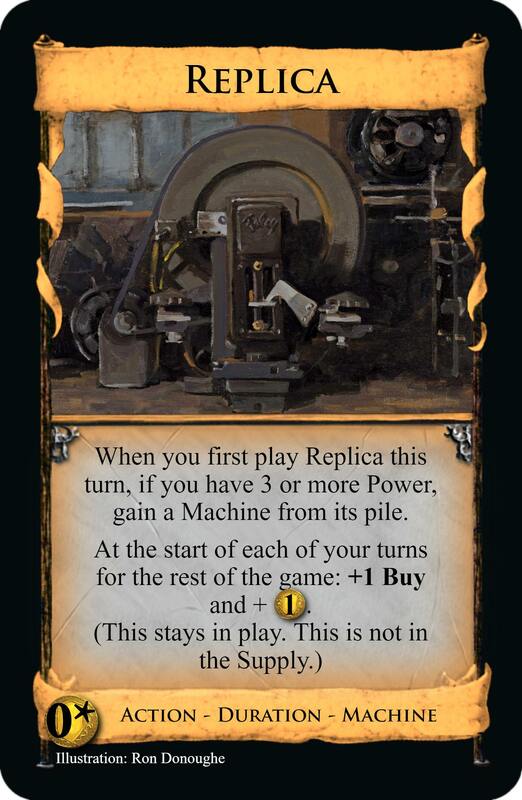 Replica - I'll have to spend some more time thinking about this one to give worthwhile analysis, but I think you made the right call by making a Machine that gives +Buys and is not one of the already very powerful cards. This also makes your Prototyping stage more relevant. I also like how it's not trying to compete with Spinning Mule, Steam Engine and Patent; it's just there if a player needs +Buys. Really exciting stuff! Can't wait to see how it all comes together! Parade - Victory, $5 cost. Worth 8VP - VP equal to the difference in the number of Actions and Treasures in your deck. When you gain this, if you have a different number of Actions and Treasures in play, trash it. When you gain this, if you have any duplicate cards in play, trash it. When you gain this, discard your hand. If you didn't discard exactly 3 cards, trash this. When you gain this, reveal 3 cards from your hand with no matching type. If you don't, trash this. A pile of 12 with 3 of each, and you use 2 of each for 2 players. Each is a cantrip so that when you can gain them, you don't mind adding them to your deck. It's possible to have a turn where you can get several different ones at once; I'm not sure if that's a good thing or not. Steelworks - Action Night, $4 cost. If it's your Action phase, gain a card costing up to $4, or if you have used 3 or more actions this turn it may cost $5. 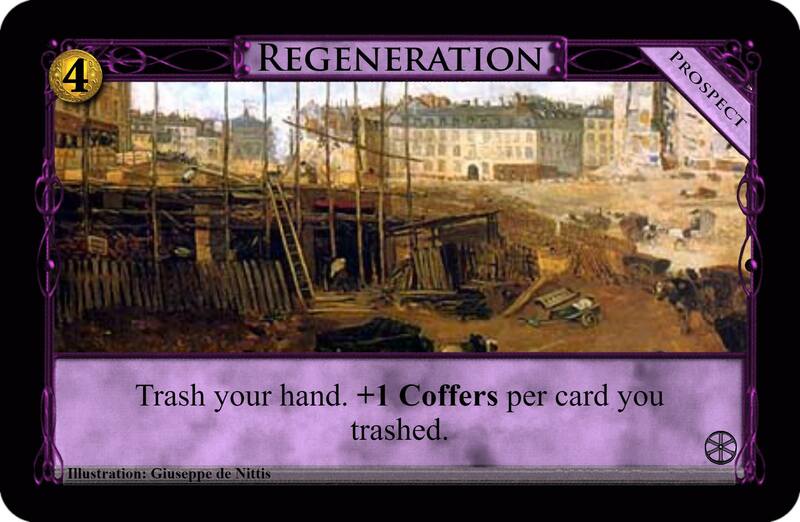 At Night, you may trash this, to take an action token for every card you've gained this turn. You may gain a card costing exactly your Power in $. If it's a Victory, -2 Power. It would be silly to go with +$, as you could go unlimited and need unlimited tokens with it. This makes a cap whilst retaining the feel of Power as currency. Seems balanced in testing. It's been more pleasant playing without it than with it. I get the sense it's one of those ideas that looks pretty on paper but actually isn't good in practice. All too often it's granting players bonuses or screwing them over by pure chance, and there's nothing they can do to actually adapt to the situation as intended. The idea may be nice for casual players, but it's not suiting what Revolution tries to be. With the change to Power, the set is heading towards encouraging skill and resource management, probably suiting more advanced players. So, it seems best to disassociate the Weather with this set. Parade - Very thematic! 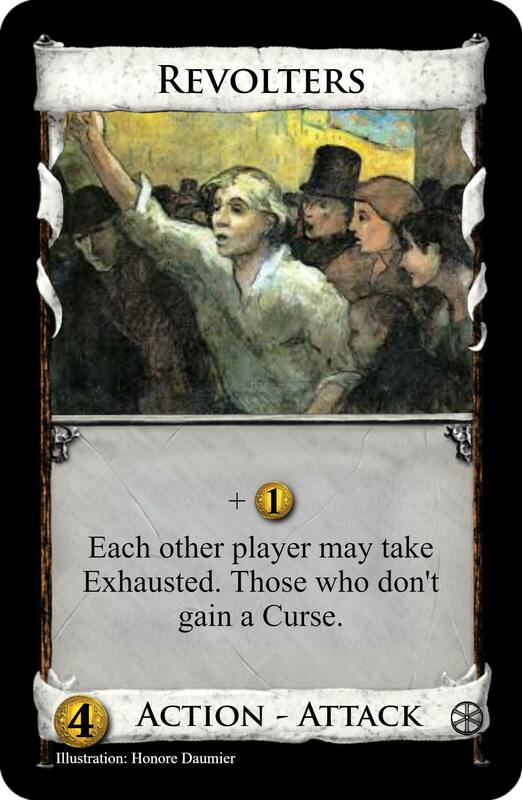 Parades often showcase different things and now this card does as well. I've been trying my hand at a VP card that cares about Action and Treasure density being the same and boy is it tough. I think you're making the right call to just make this a flat VP amount and retaining the idea through an on-gain effect. So is there a reason you're not going with Grand Market wording? Like, "You can't gain this if the number of Action and Treasure cards you have in play are not the same." The wording would be a bit more clean, but then I guess your wording allows for a Salt the Earth type effect. 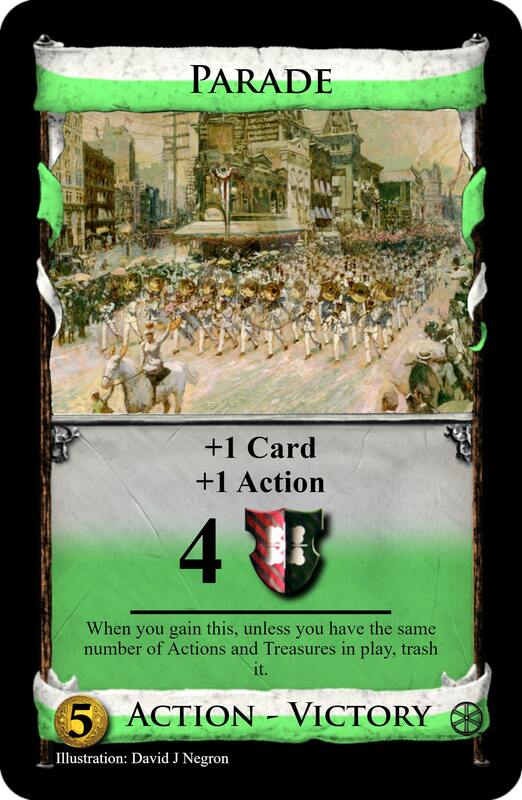 You can trash Parades simply to deny the points to your opponent if you think they will have an easier time satisfying the on-gain. Very cool stuff! 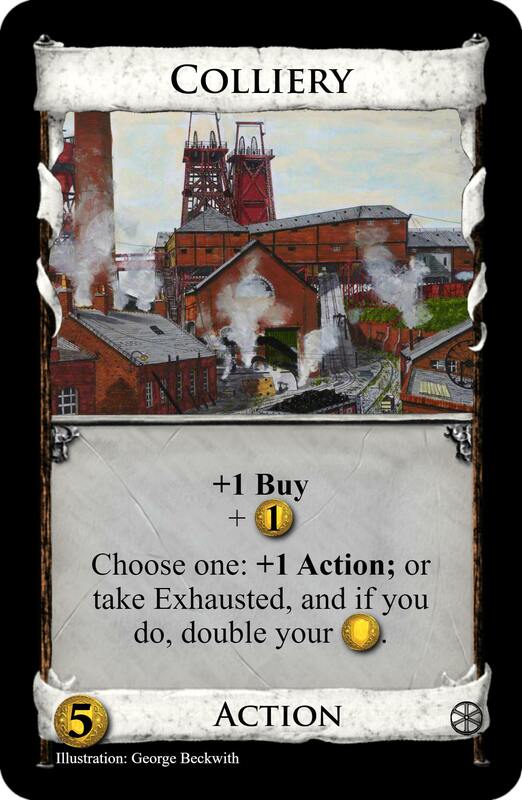 Steelworks - Nice to see the new card with the Power mechanic. First impression is this might be a bit slow on it's own as a gainer. But it also acts as a kind of Coin of the Realm. Seems very versatile, but requires good play to really make it worthwhile. It could make an amazing, non-terminal, non-Victory card gainer once you get your Power level up to 4-6. I imagine in most games you can only get about one Province gain off of this. Weather - I'm sure there's a way to make this both fun and rewarding to play with, but it's late and nothing is coming to mind. I'd hate to see all those cool mock-ups go to waste! 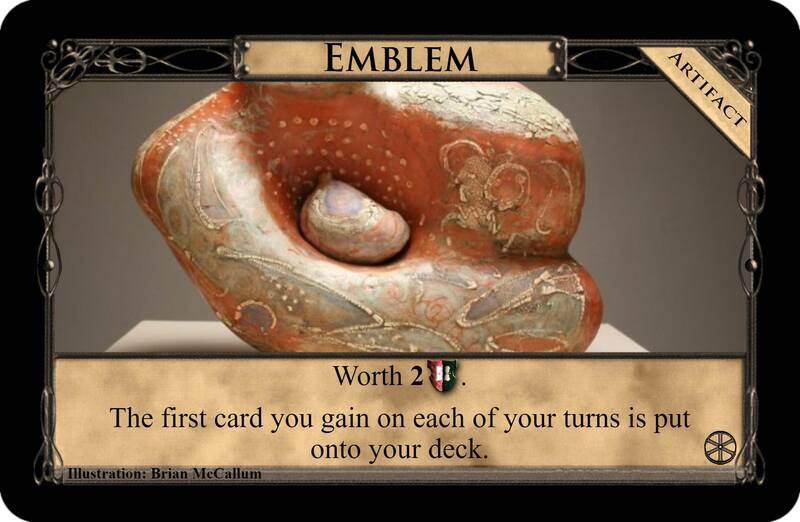 With Renaissance around the corner and Action tokens becoming "official" I just wanted to give a quick thumbs up for the hitherto most comprehensive fan card design involving Action tokens. Heh, that denying would be seriously hard to pull off, if you get $5 to casually spend like this. To tell the truth, I thought that 'you may only gain this if...' could cause some to think they can still buy it, and what happens then. Self trash is safe from this, and it conveniently gets itself around Lurker. Decks concentrated purely on playing Steelworks often, with trashing and thrones, have seen them get Provinces at an average rate, 3-4 in 15-17 turns. So it seems beatable but a viable option. Non-Victory cards you buy are set aside onto this. 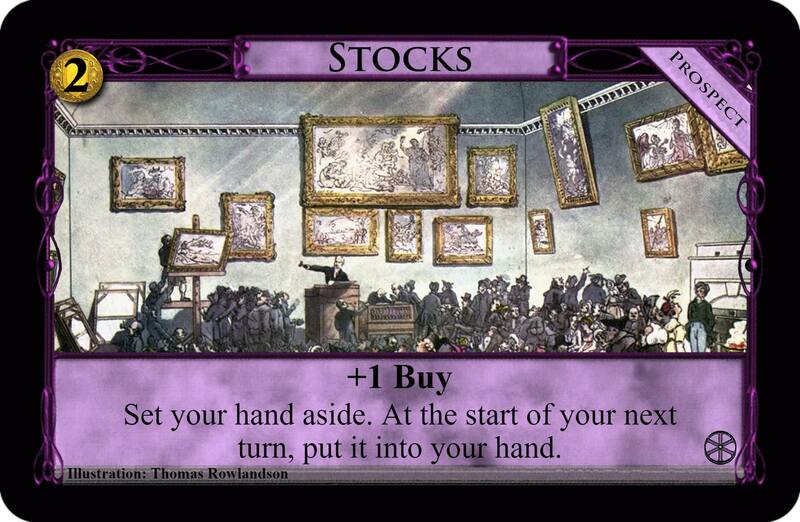 After your Buy phase, for every $1 you have unspent, you may discard a card on this. When the last card is discarded, return this. Making large on Wine Merchant's delay. It fits the resource control theme better, involving money and timing skill. Is the 'set aside' bit sensible? What would technically happen if you have Tracker in play? That leads to the cards that use it. Pretty much a complete turnround from before, Foreign Art as before is more elegant than Dairy Farm in diverting itself together with what you buy for the turn. With the money you need to buy them off Diverted, $4 is fine. Each other player takes Diverted. Those with 4 or fewer cards on their Diverted reveal the top 2 cards of their deck, put one costing from $3-$6 onto Diverted, and discard the rest. It has the limitation of working on only up to 5 cards. It's softer than trashing the target cards, but with the addition of buys being diverted too. Night Shift - Event, $0 cost. Once per game: take Exhausted. If you do, and the previous turn wasn't yours, take another turn after this one. One free resource to time carefully. It fits the resource management theme. Once per game: draw extra cards for your next hand equal to your Power. In games using this, when you gain a Silver, +1 Power. Once per game: discard all cards on your Diverted. Setup: each player takes Diverted. When you return it, take it again. 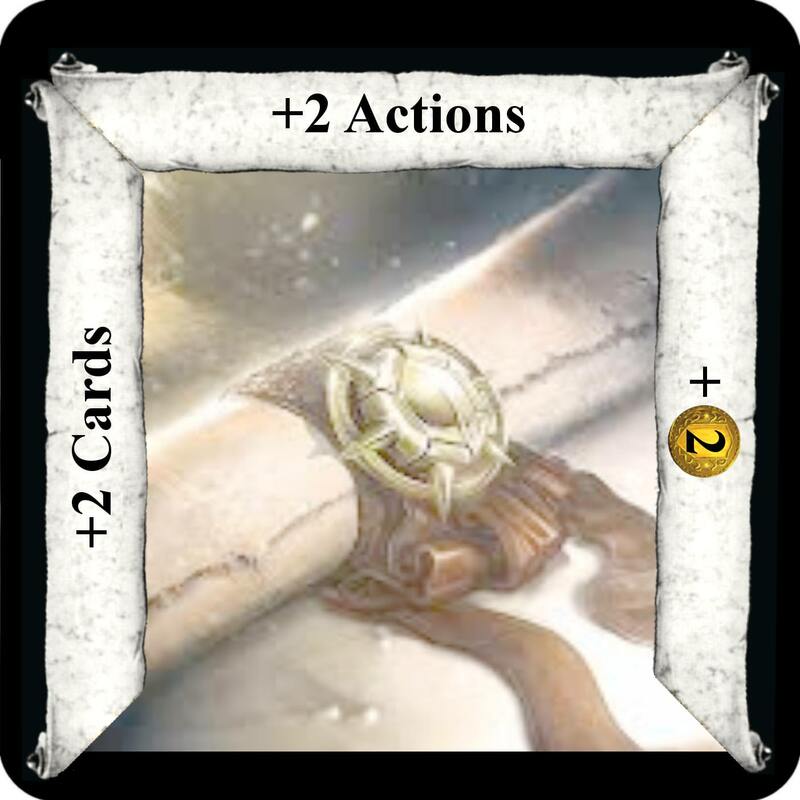 Once per game: if you have at least 2 Actions in play, gain a non-Victory Action card to your hand, return to your Action phase, and +1 Action. Counts Actions in play to help prevent crazy openings. I've seen one-use events on the forum somewhere, haven't I? Again though, I've forgotten them and these are of my own originality. You've seen them in the actual game with Inheritance. Yes; these are trying to play differently from Inheritance so I never mentioned it. Inheritance has to be once per game for what it does. You strategise if it's worth going for and build up to it quickly. These are easy to get but call for good timing. Still, Renaissance is exciting news. Looking forward to seeing how Action tokens 'should be done'. I've tried to make them as different as possible from +Actions here, that was one of my aims, but my views could be wrong. Seems best to postpone this until it's out. 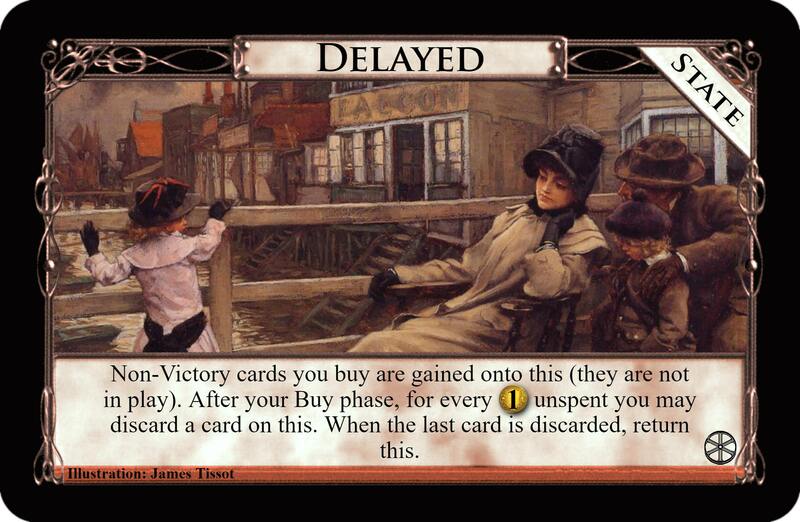 Diverted - Big fan of this version where you essentially have to pay $1 Coin to get your card back. Mechanics seem much more solid than relying on some-what swingy reshuffles. If this turns out to be too harsh you could remove the 1 card per turn restriction. Tracker might allow cards to be top decked instead, but I just consider that a niche counter to Diverted. One-shot Event - I have a one-shot Event called Treaty. Not sure if you were thinking of it. Anyways, I really like the first two options, but think the Power one takes the cake. Makes for an interesting game where Silvers both enable and clog up engines. Should all of these give a Buy back to ensure maximum flexibility when bought? So one of the obvious changes to make is Power to Villagers. 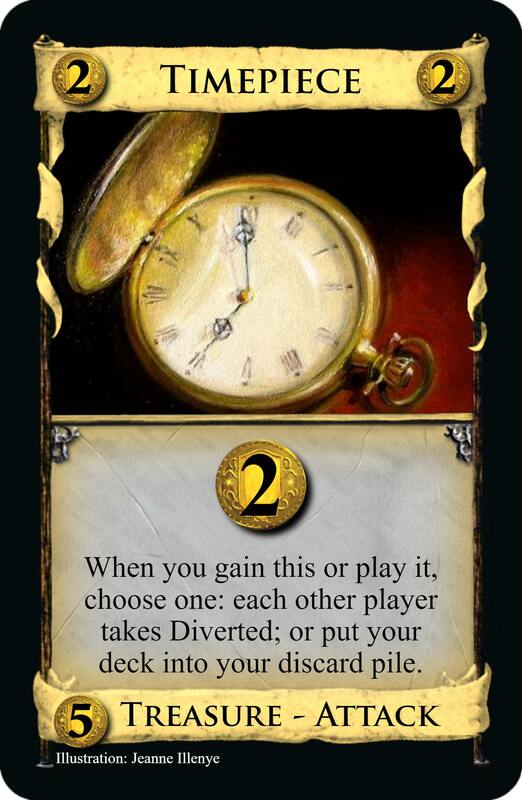 This means that the tokens will be playable at any time rather than between Actions like CotR. 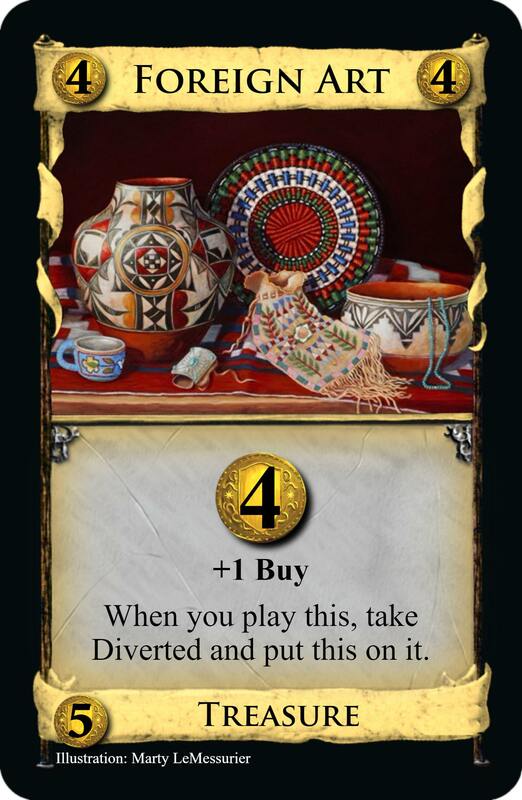 That's great; I'm glad Donald found this rule works OK.
Also means, since Villagers are defined as coin tokens on a Villagers mat, that this set should have Coffers too. Well that's fine, it would fit the resource control theme. 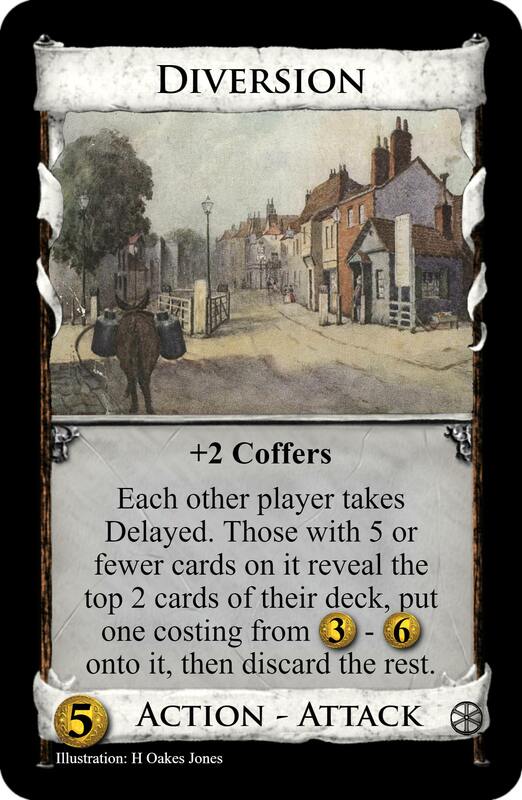 Diversion could take +2 Coffers nicely, so that a Coffers could translate to a card off Diverted. Possibly Prototype or Replica too? None of the preview Villagers cards are the same as any in the set, but possibly other ones not revealed could be; it wouldn't surprise me if Diary needs a change. Silk Merchant does what Colliery tried to do but better, on-gain Villagers. 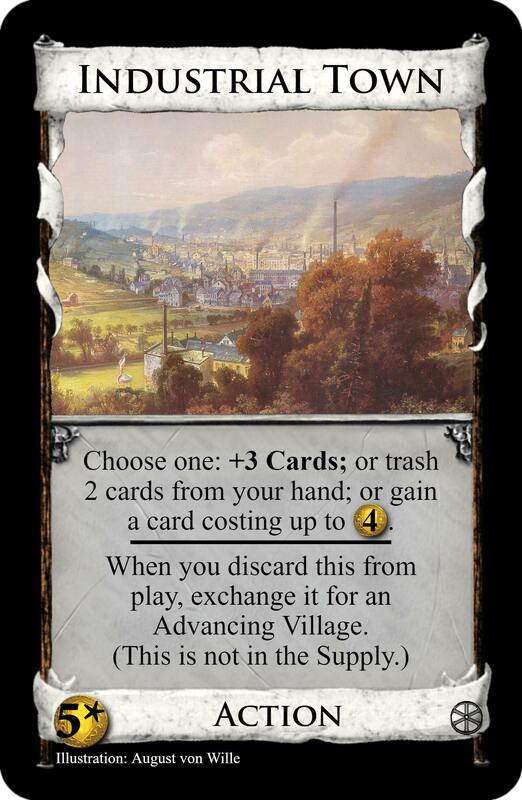 Colliery was on the way out anyway, and that one-use event involving Power (Villagers) was to replace it. I may change how it gets Villagers anyway. And Projects are mechanically identical to the one-use events, only they're duration effects and not one-off ones. If I make them all Projects that would at least take away the need for "once per game" on each card and things should be cleaner. Override - Project, $6 cost. One cheap Province to time right. Gain an Estate and a Gold. Cheap Gold that comes with an Estate so timing is less trivial. $3 cost since it seems too good with $5/2 openings. Shady Deal - Project, $3. 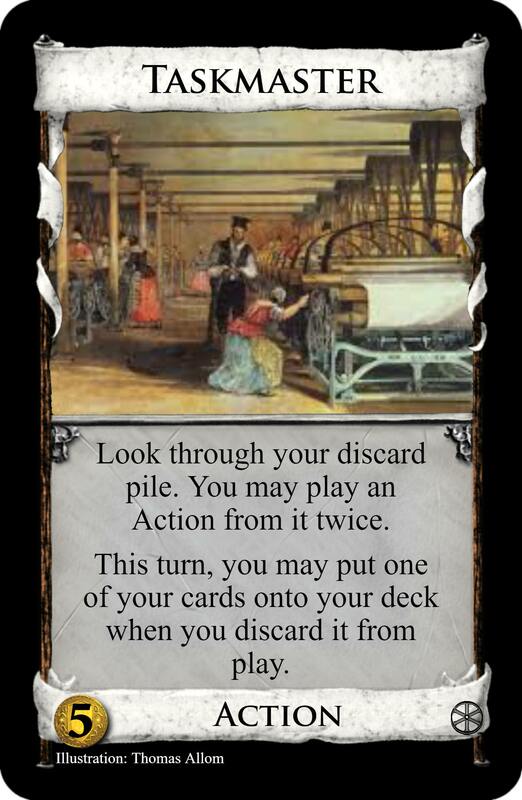 Gain a card from the trash and a copy of it from the Supply. Setup: add a random extra kingdom pile costing up to $5 to the trash. Less about timing and more about raw strategy or rare and fun VP swings. Put your deck into your discard pile, then put 5 cards from the pile onto your deck. When do you really need to make your next hand? If you gain the last card of a supply pile this turn, +4 Coffers. It may not be a good idea to encourage pile emptying. Long story short, it looks like Revolution should become an extension to the Renaissance expansion. 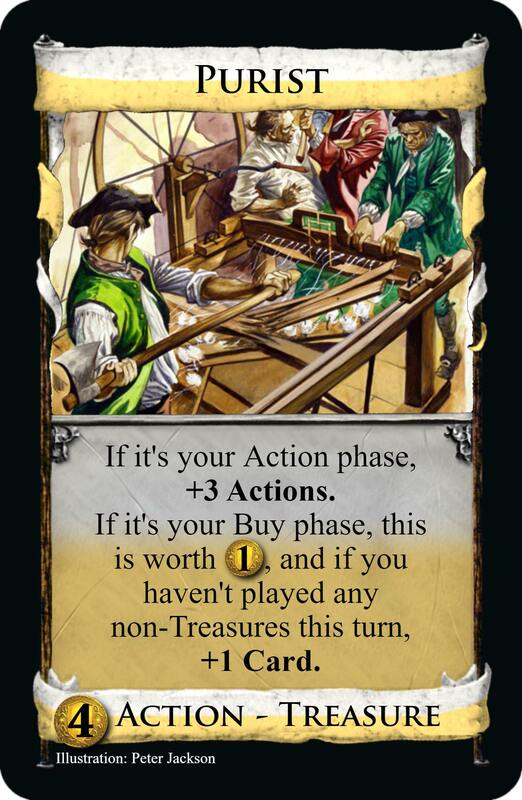 Where Renaissance is simple Revolution can try adding some skilled depth, and at the same time Renaissance provides an abundance of simple cards that many in Revolution really like (looking at Patent in particular). Big OP overhaul probably not until after Renaissance is released. 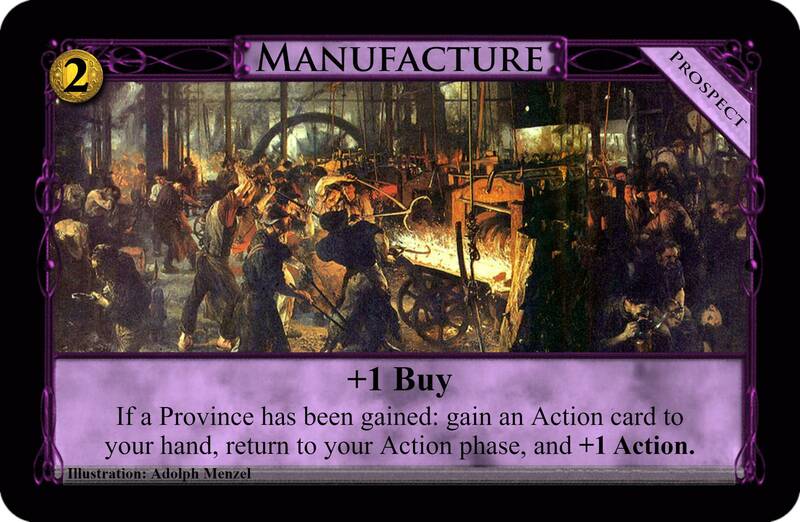 It's been said before, but it's really cool how much of the Renaissance mechanics, Revolution got correct! I can't wait to see what you come up with after seeing the rest of the Renaissance expansion. I really like most of your Projects, but I wonder if this medium is the best way to execute these ideas. Projects seem to be for reoccurring things. I'm sure the way you've worded it is legitimate, but I think a players natural inclination will be to execute the Project every turn, not just once. I think keeping these as one-shot Events is the way to go. If you do keep these as Projects, my second suggestion would be to name these as nouns and not verbs. Override - Very straight forward, but as you said, the timing on when to buy this is complex! I wonder what the new Big Money benchmark would be with one Province costing $6? Shady Deal - This is very interesting. As worded it is a one-shot, so I'm assuming the player has to weigh getting an early $5 cost from the trash for $3, or waiting for a card from the Supply to get trashed so you can gain two copies. The latter is board dependent and may not happen often, and the former really depends on the random $5 cost in the trash. I suppose most $5 cost are good enough that you'd want one for $3 despite it possibly not meshing well with your engine. Project - Empty Supply Pile Coffers - Another very interesting idea. This currently seems a bit swingy. The opportunity to empty a pile occurs only so many times. One player could easily get the Coffers 1 or 2 times just by luck. Keeping track of the piles to make sure your opponent doesn't get the +4 Coffers might be tedious. In the end this might actually discourage players from piling out. I agree with Kudasai, I doubt that Prospects warrant a new type as they can be implemented as one-shot Events. I also think that some could be more expensive. 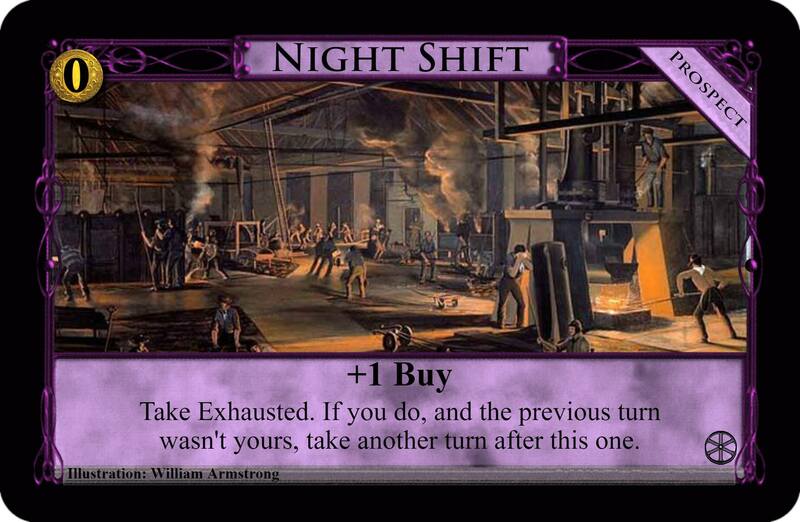 For example Night Shift is one extra turn for free. Perhaps I am too stupid but isn't a quicker build-up nearly always better than the endgame shenanigans you could do with this? 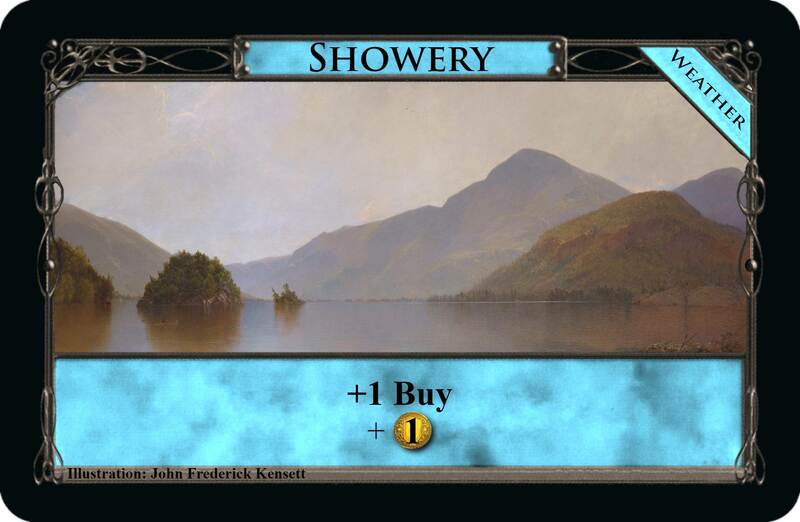 If you gave it a moderate price you would at least prevent that everybody uses it on turn 1 (even if I am wrong and this is not often the dominant strategy players could misevaluate it like I just did) which means that it does nothing. Ravage is a pretty crazy BM enabler that could preemptively prevent engine play in multiplayer games. If your opponents build up, just wait until they gained 5 Villages and then you destroy the rest. Ah well, my OP update wasn't so stealthy after all It's as good as done and ready to read though, just still vulnerable to what the unrevealed Renaissance cards do. There's a big list of changes I'll get back with shortly. I appreciate your feedback Holunder. The Prospects are almost untested ideas probably full of issues. I believe going with the new type follows Donald's thinking. 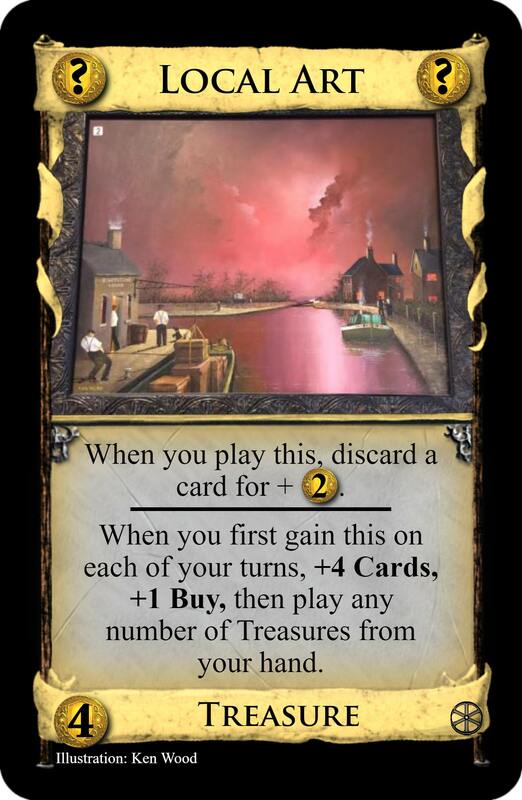 The Projects could all be Events with 'once per game' on them: Inheritance is basically a Project, and likely if revised Donald would make it one, because it's easier, cleaner and fewer words on the card. Similarly, the Artifacts could have all been States, but the type change distinguishes their purpose from Deluded and Miserable. So I would prefer that these be Projects (and renamed) over Events, as that would make things easier for a new player to pick up what they do. Yet as Kudasai said, it wouldn't be exactly clear. To distinguish their function from Projects and Events (only Inheritance is technically buyable once), I concluded a new type, which conveniently looks similar to the word Project. You could well be right here. In my mind both the building and the potential for an extra Province or two later would be valid considerations, but if the former always wins out a price increase is the way to go. I overall erred on the cheap side so they would be readily available for when players think it's the best time for using them. 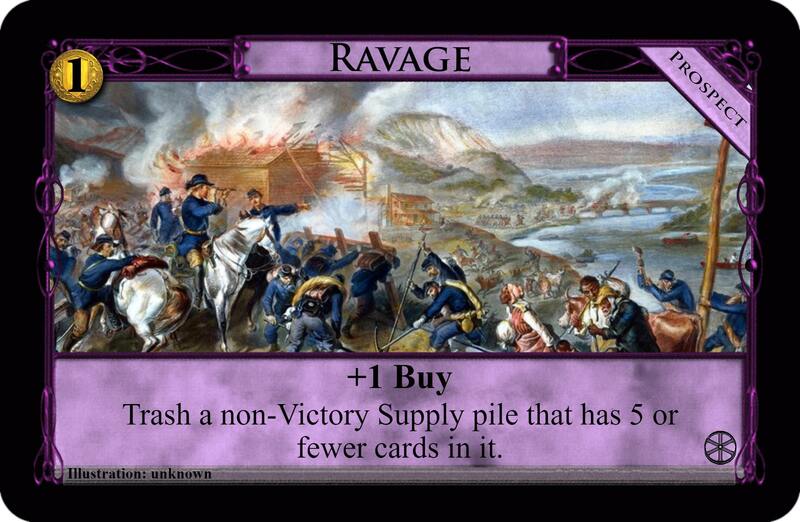 Ravage is a pretty crazy idea. An alternative take on the emptying a pile for Coffers one I posted before, but as you've identified pile emptying focuses can spoil the fun rather than add to it. Diverted has been renamed Delayed, and has clearer but longer wording. 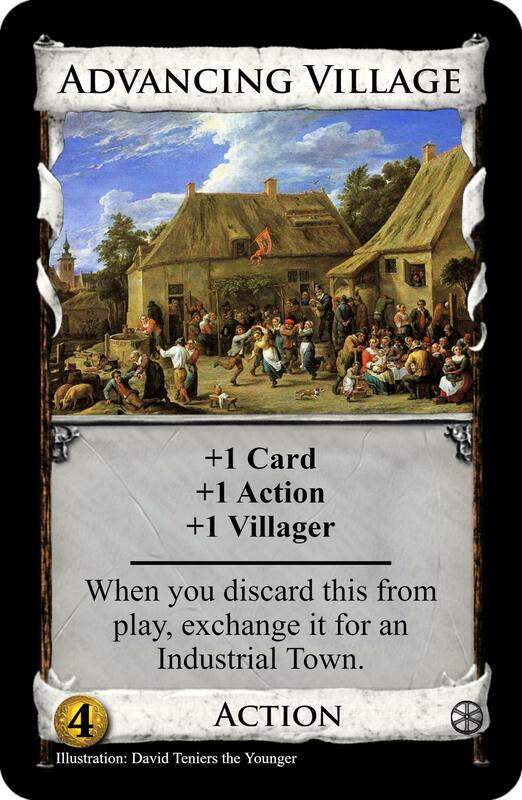 The card called Advancing Village has completely changed, but the mechanic of the old version has been kept and put onto a new card, Trade Circle. This is a cantrip +Villager, dubious, but it gets away with it by changing into a terminal. Two modes of the card to get in good balance. 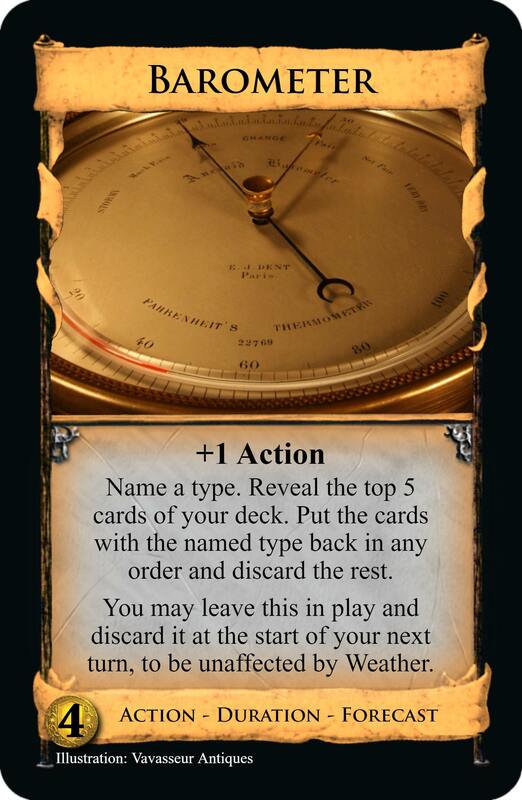 Barometer has been renamed Timepiece, and now has +1 Action. With there being a Project called Canal, the Bridge variant is now called Mail Coach. It has clearer wording. Colliery is now an Action doubling your $ when you take Exhausted. The main novelty of the former version was the Villager on gain, which thankfully Silk Merchant does. There was nothing else going for it. I'm aware of Neirai the Forgiven's attempt at doubling $, and I'm hoping Exhausted is a way to make it balanced. Diversion has been changed as described before, soft Knight variant with Coffers. 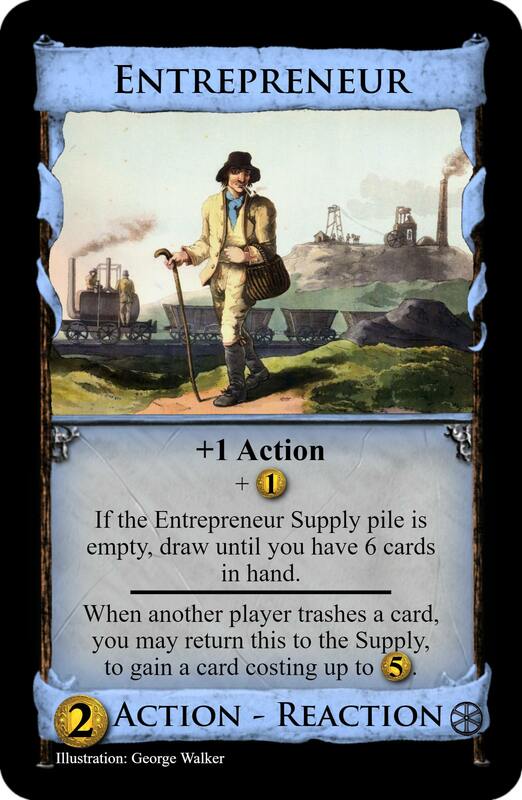 +1 Buy did not belong on the empty-pile Entrepreneur, so to be a slightly better Peddler it instead becomes draw to 6. 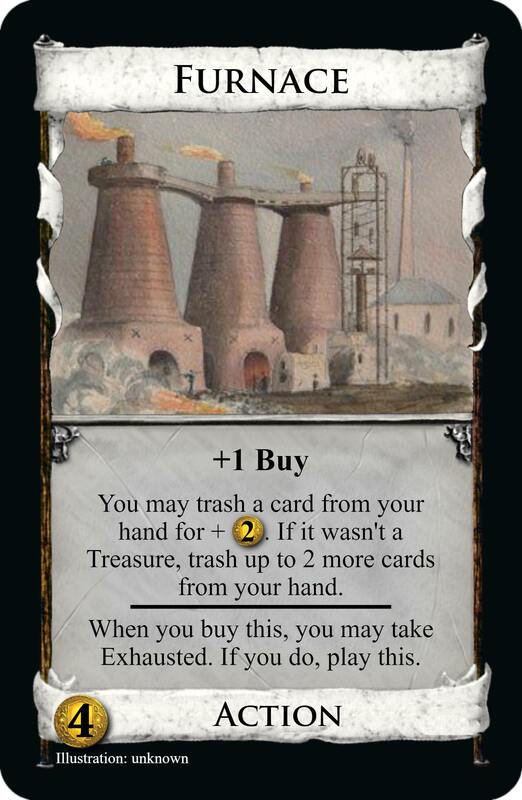 Furnace simply works on buy and play rather than take Exhausted to play, and no longer gives $ or +Buy (there were a few too many +Buy cards). But now it feels like it needs something more. Innovator was too strong, and boring with it. Full discard then draw could easily and frequently get $8, so it was all you needed for a reasonably fast win. The new Colliery at least needs work. Parade is down to just the Actions and Treasures gain condition. That bottom text is way too small to read every time, and the others weren't even that interesting. Going with Grand Market wording would make this text a bit bigger, and is the issue of buying it whilst not gaining it that major...? Potteries for now has become this deck inflating variant. I reasoned that there doesn't need to be many two-Action cards with Exhausted, and those that do should be definite core engine pieces. A Remodel could fit this, but not as well as big draw or $. Oh yeah, that Purist. There was an interesting point in the secret history of Nocturne outtakes, that Donald found cards with a choice between Actions or $ were uninteresting. I felt what he meant with this. All this time I was saying Revolters can't hand out Exhausted. Uh, it can if other players 'may' take it... This is actually threatening now it's not a Duration. I made this Taskmaster before I saw Mountain Village. Here's a more simple, different and compelling Throne Room variant than the former version. 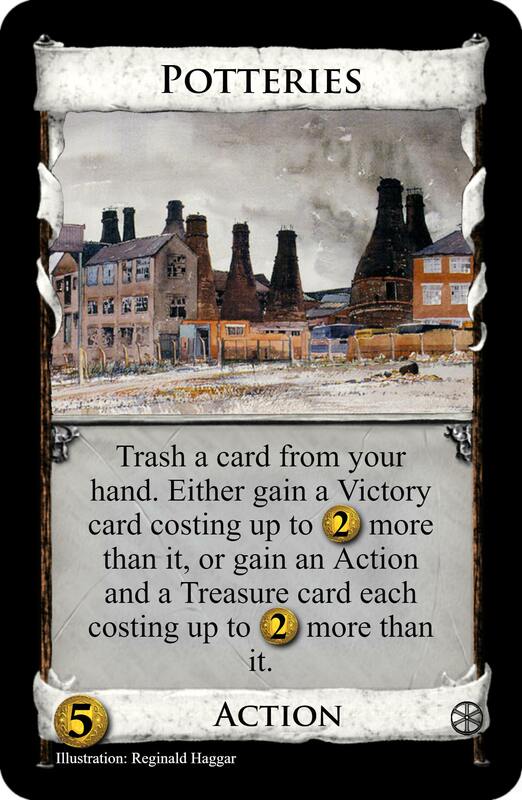 A boost to +3 Cards on Exhaust for Textile Mill, to give it a little more over two Smithies than being one card. 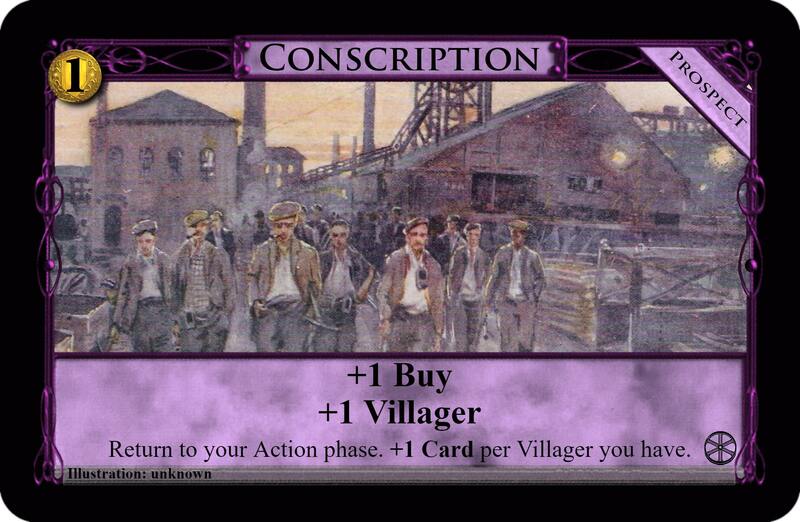 The addition of Coffers means the overpay achieves Coffers > Villagers translation, so this may be more reason to move it onto a cheaper card. 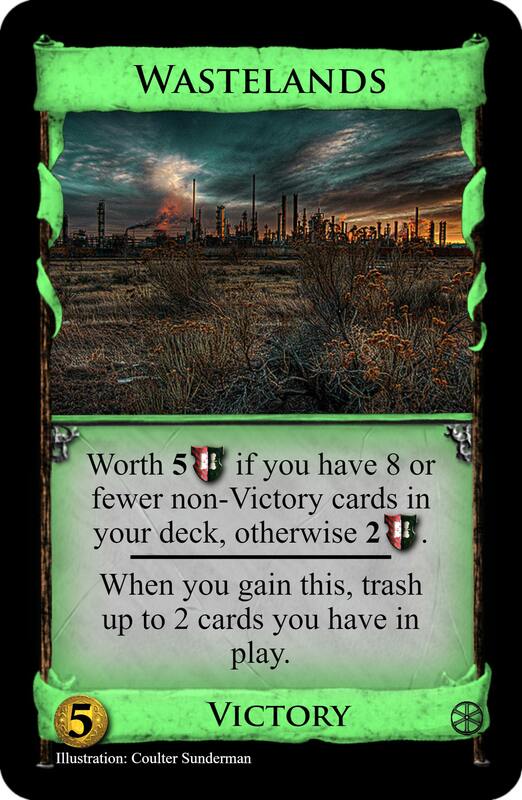 Two nerfs for Wastelands to emphasise it as alt VP, the non-Victory cap is down to 8 and the on-gain trash is down to 2 cards. Components may gain Silvers now. Replica doesn't really need any limitation to its gaining another Machine. The Villagers (then Power) it needed I think was only there to show what I meant by needing to manage a number of tokens on the mat. When will this Steam Engine ever be right? This version is what I posted last time but with the added option of Exhausting at Clean-up to Scheme it, so it can be like a solo engine enabler. The Taskmaster change, though, seems to hold promise, and this doesn't stand out that differently. A boost to Spinning Mule that lets it draw more cards with non-Copper Treasures. Patent now has its bonuses on the mat so you can't change what you choose. This is more realistic, though it makes more different Patents available and so weakens the uniqueness advantage. Dismiss, a cantrip $2 that lets you discard a card to change it for a different one of a matching type in the deck. Clayfields, as made for kru5h's design challenges thread, under the name Farm. A third Victory pile works because Renaissance doesn't have any. This $6 Hireling variant draws a card for your next hand for every Victory you gain this turn. Local Art is back; at $4, it has a radical on-gain of drawing 4 cards then letting you play Treasures. The on-play is discard a card for $2. 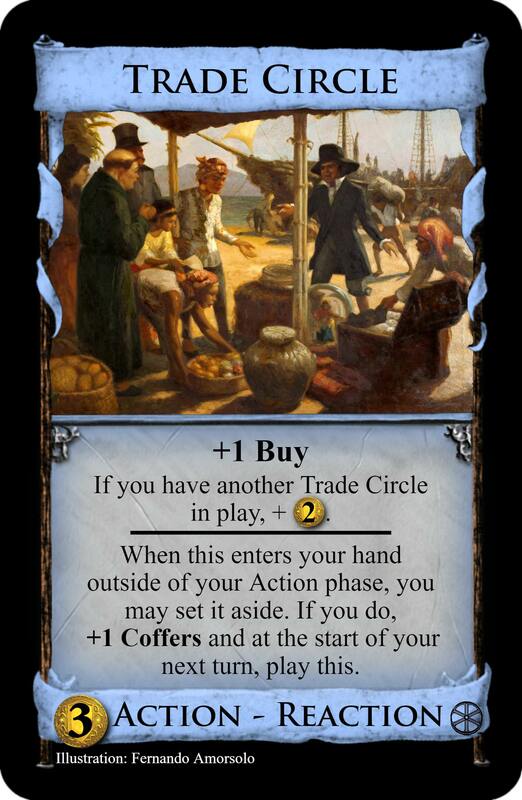 Trade Circle, the new enter-hand-outside-Action-phase card. For a player to want to make this trigger, it needed to be payload and not a mere Village. So at $3, it has +Buy, +$2 if there's another Trade Circle in play, with the reaction being set aside, +1 Coffers, and play it next turn. And the Prospects. 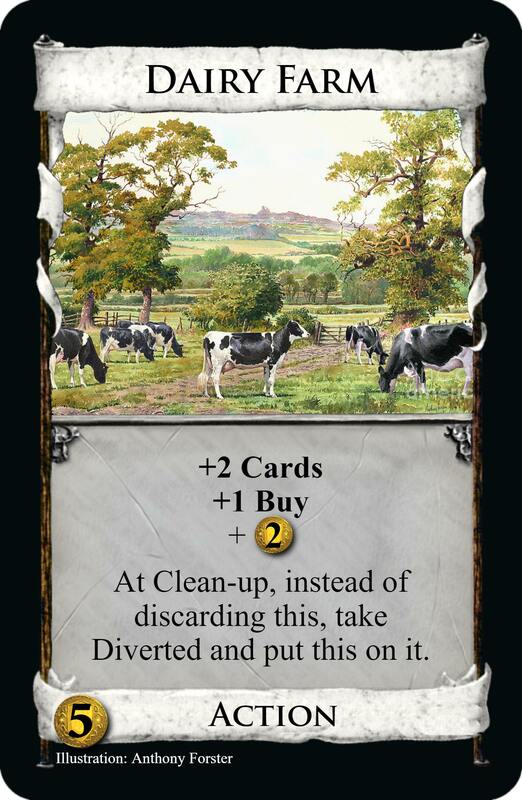 Override is now called Takeover, Innovate is now called Manufacture, Prediction works after discarding at Clean-up so your newest buys can be included. Shady Deal didn't work, nor did the empty pile for Coffers one, and the Estate and Gold one doesn't look so convincing. And yes, an Artifact has crept in amongst them, attached to Exhibit. Because this is now a Renaissance extension and I have Artifacts at my disposal. More updates likely as and when all of Renaissance is revealed. Page created in 0.442 seconds with 21 queries.